Tiles don’t fade or bleach in the sun, however, they are subject to damage. Besides getting affected by continual exposure to harsh acidic cleaners, tiles can be cracked or damaged, especially by impact. Most homeowners often come across discolored and damaged tiles in their bathrooms and probably you are included. Repairing discolored and damaged tile isn’t only a cumbersome job, but also a messy and dirty one. To save yourself from doing the repairs, you can hire the professionals. In most cases, discolored or damaged tiles can be replaced. If you managed to save spare tiles from the original installation they will match. If not you could lay out a pattern combining some new tiles with the old ones. But to get the best results you would have to tear out far more tiles than just the damaged few. Of course, removing and replacing loose floor tiles is the best and preferred way to repair them. 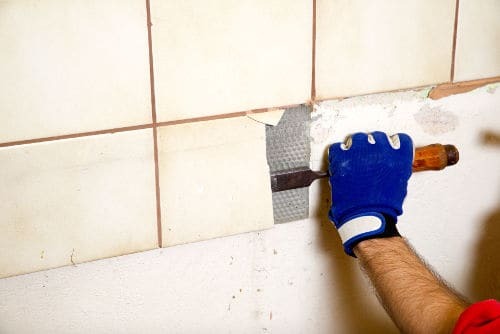 However, if the tiles in need of repair are on your walls, shower floor or even countertop and back splash we have an even better solution than replacement. We are talking about refinishing, recoating or reglazing. Total Koatings uses a non-toxic state of the art KV-40 glaze manufactured in the U.S. This glaze will give your old tile a durable hard porcelain finish that resists scratches and will never peel or flake. Best of all we can repair cracks and chips, cover stains and give your tile a smooth easy to clean finish. Not excited about the retro color? No worries as we can use the color of your choice and even create a pattern or accent stripe. This coating works on any hard surface so your sink and fiberglass tub can also be renewed to match the tile. The one thing we can not resurface is the toilet. This is by far the fastest and most cost effective way to restore your tile and truly the entire bathroom. In a matter of hours, you can have a brand new look with little to no effort on your part. No mess, no stress and easy on your budget – call Total Koatings and get a dream bathroom on a budget.